The goose is an experiment in farming for me. I have chickens and bees but both earn their keep and will eventually die of natural causes and so I have never had to murder an animal. Oh, I’ve hunted plenty but that is far different. In hunting, your interaction with the animal is momentary, distant, and sporting. No, to raise a farm animal, means you have to feed it, care for it, and eventually kill it. I don’t take this lightly — in fact it bothers me a lot. However, I’m not planning on becoming a vegetarian, so to shy away from it is hypocritical (but understandable). On Saturday, my wife and I drove three hours round-trip to Grenada, MS and purchased two geese. 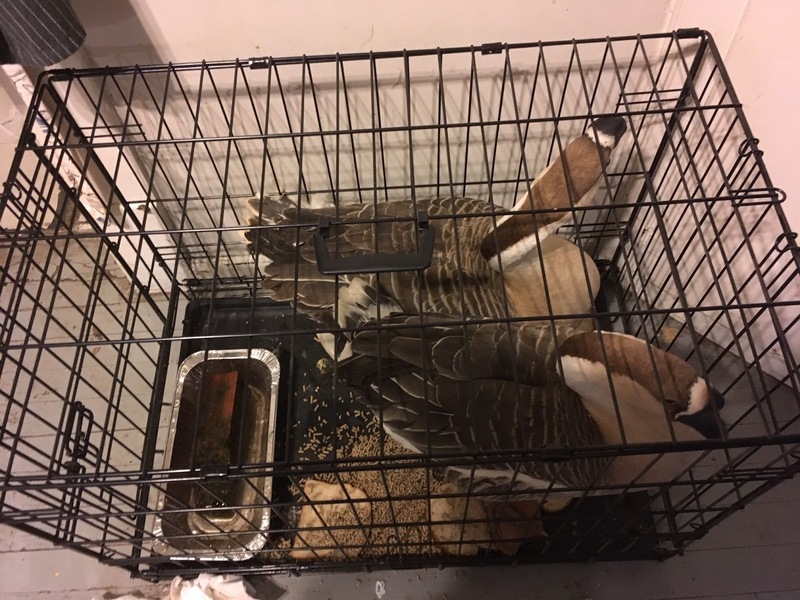 $70 for two large African Geese (I paid as much last year for a frozen one at Walmart). I expected them to be aggressive but the farmer just grab each of them by their wing (up near the shoulder) and transferred them from his cage to mine. The two geese were sleek and quite beautiful. I quickly decided to harden my heart to them and closed the back door of my SUV. I failed to make any sort of enclosure for them. To make matters worse, it was in the low 40’s and raining all day Saturday. I did my best to build a cage for them but ended up pulling my back. So we brought the cage in the house for the night.